I never thought I liked green salad because all I ever saw when I was growing up was insipid iceberg lettuce, dry pre-shredded carrots and gloppy ranch dressing. Now that kind of salad has its place, just not in my kitchen. 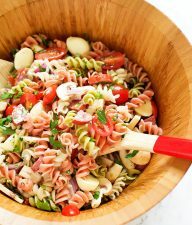 Salad can be much more adventurous and delicious. I have a little formula I like to use when composing a salad. Feel free to add your own tips in the comment section so we can all benefit. My formula is this: greens+fresh fruit/veggie+flavorful cheese+something crunchy+meat (as a main dish)+a killer vinaigrette. And then I play around until it’s perfect. Think about the flavor of the greens when you are getting ready to make a salad. Do you want a mild green like Romaine or Butter lettuce? Or something sharper or bitter like radicchio? Or peppery like arugula or watercress? Baby greens are sweeter than full grown. Also, think about the texture. I love the softness and mildness of Boston Bibb lettuce sometimes, and other times I prefer come crunch of the frilly chicory. Baby spinach is great because it is almost flavorless and therefore a blank canvas. You can add in fresh herbs like parsley or basil. You can use beet greens or celery leaves. If you can, try to buy salad greens in a plastic tub. I find they are cheaper in the larger tubs when you buy them at Costco. Even stores like Whole Foods can be less expensive than the grocery store. The greens keep better and longer in the tubs. Store them in the bottom of your fridge or in the veggie compartment. Sometimes I will lay some paper towels over the top to keep them from getting too much moisture. Check the temperature of your fridge frequently, too, to make sure it is neither too warm or cold. I like to add seasonal fruit and veggies because, of course, they are going to have more flavor and be fresher. Some fruits or veggies are available (and good) year round. Those include apples, pears, oranges, grapefruit, avocados, carrots, onions, mushrooms, jicama, celery, etc. In the spring, you can add asparagus, beets, peas, and other spring veggies. 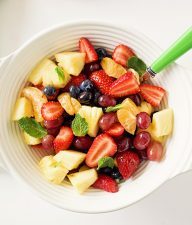 In the summer and early fall, I add strawberries, stone fruit (like peaches, cherries, nectarines or pluots), berries, figs, tomatoes, sliced peppers, etc. Don’t forget that you can add dried fruit, too. We love to add dried apricots, raisins, cherries, cranberries, currants, dates and others to salad. They pack a lot of flavor. 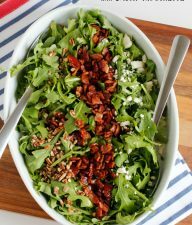 Brine-cured olives or sun-dried tomatoes are another great addition to any salad. Roasting your veggies or fruit also can add depth and variety. Consider roasting cubes of squash, beets, apples, or pears. Another fun thing to add to summer and spring salads is edible flowers–nasturtiums, pansies, violets, etc. Just make sure that they are free from pesticides and fertilizers. Canned beans or other veggies (like roasted peppers) are wonderful, too. Cheese is a great addition to any salad, but you don’t have to have it. We like sharper, pungent cheeses when we use milder greens and additions. A milder, creamy cheese may be in order when using sharper, bitter greens and additions. Remember to go easy on the cheese. A little goes a long way. The something crunchy could also apply to fresh fruit and veggies, but I mean nuts and croutons. Think about candying the nuts to add a little sweetness. Toasting adds more flavor and depth and make the nuts even crunchier. You can also buy the nuts already candied, toasted, or seasoned at the grocery store. Nuts that work well–almonds, pecans, walnuts, hazelnuts, macadamias, cashews, pistachios, and pine nuts. Croutons can add that extra punch of flavor, not to mention texture. Homemade croutons take it up to another level. Personally, I like to add croutons when I’m using a creamy dressing and have a salad full of veggies. I can’t think of anyone I know who doesn’t like croutons. 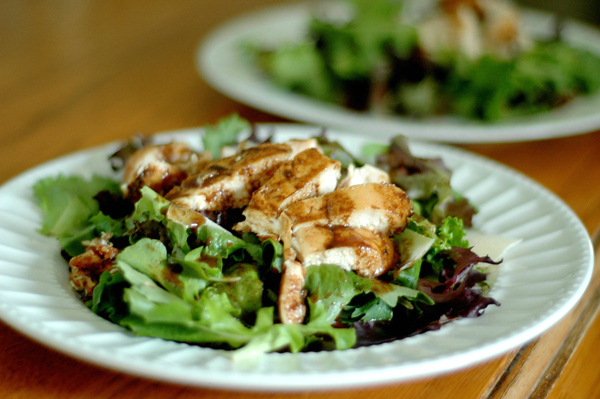 Grilled chicken, beef, or pork are great additions to salad to make it a main dish. Shredded leftover chicken is great, too. You can make your own restaurant style salad by adding breaded chicken breasts. Bacon. Bacon is always welcome on any salad I make. Also, think about trying other cured meats–pepperoni, salami, prosciutto, or pancetta. They add great flavor and go well with veggies. Tofu or meat replacements also work well for salads. I like to marinate cubes of tofu and saute them in a little oil. Another way to add texture to a salad. I have a list as long as my arm of favorite homemade vinaigrettes. I think a good vinaigrette can make the salad. If you choose to buy one instead, splurge on a good one. Our family likes Briana’s brand the very best. Start with a basic recipe of oil, vinegar, a little Dijon mustard, a pinch of sugar, and salt and pepper. Go from there. Chopped fresh herbs–cilantro, parsley, dill, basil, oregano, etc. I love fruit in my salad. I think it changed my life. For those days when I don’t have fresh fruit around, I keep bags of dried fruit like cranberries and cherries in my pantry to add to salads. Both are divine. I agree with your salad formula. Salads growing up were only iceberg lettuce, cucumbers, tomatoes and some kind of ranch dressing, all of which i dislike. Thank you for your suggestions, they are right in line with my tastes. I’ll have to keep them on file for Summer salads next year. Thanks for all the great comments. I am loving YOUR salads. Adding them to my list…. thanks for posting… that “formula” totally makes sense! Oh yum! My favorite is couscous + tomatoes + cucumbers with a little balsamic vinegar, sea salt, and olive oil. Delicioso! Oh my Lindsey just writes the best posts ever, I want to know when her cookbook is coming out ;) No really I do. Mmmm – I think I will have a salad for lunch… and maybe dinner! Whenever we add fresh fruits to our salad, I hold off on the tomatoes – somehow the flavor isn’t quite right. And when I can get ripe mangoes (farmer’s market) I love to dice them up and add strawberries and blueberries with feta and baby romaines, candied pecans or cinnamon toasted almonds. It tastes great with a yogurt vinaigrette and some balsamic marinated grilled chicken. I love your salad ideas, especially adding seeds and/or bacon. The little bit of salty helps to bring out the sweet flavors. I love the combination of flavors and textures! Looks like a great recipe! 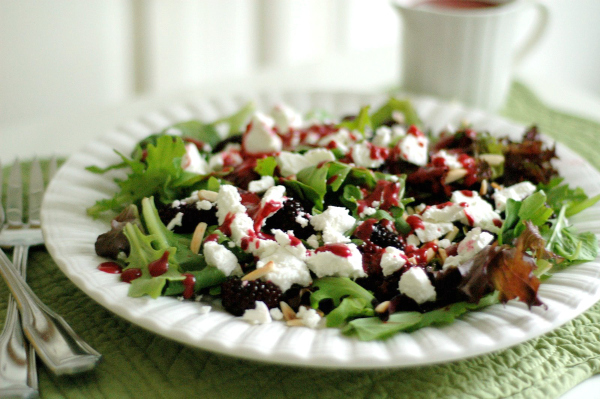 That blackberry salad looks killer! 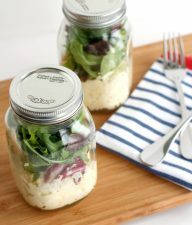 Even a very basic salad can be made so much better at home vs packaged. Last night we had romaine & spinach mixed together with slivered carrots, baby cucumbers, grape tomatoes, and yellow pear tomatoes. I threw together a quick lemon balsamic vinaigrette and topped with a sprinkle of feta. It was great and nothing fancy…though I do love fancy! Delicious post! I want to go eat salad RIGHT NOW!! 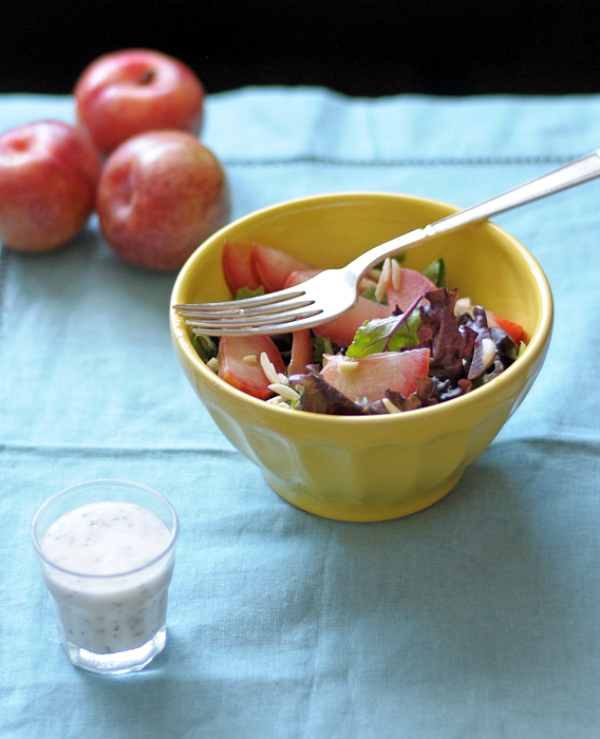 We love boston lettuce with pears, feta and a sweet white balsamic mustard vinagrette! Oh yes, and don’t forget the candied almonds! !